“Doom loop” begins to exact its pound of flesh. In other words, despite years of the ECB’s multi-trillion euro QE program, which is scheduled to come to an end soon, the so-called “Doom Loop” is still very much alive and kicking in Italy. 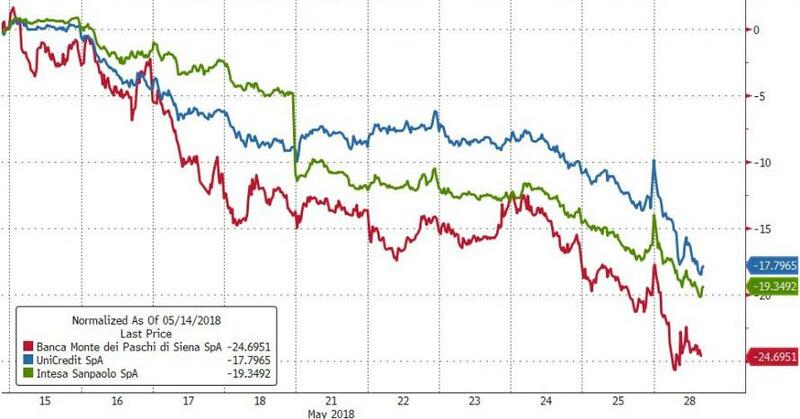 The doom loop is when weakening government bonds threaten to topple the banks that own the bonds, and in turn, the banks start offloading them, which causes these bonds to fall further, thus pushing the government to the brink. The doom loop is a particular problem in the Eurozone since a member state doesn’t control its own currency, and cannot print itself out of trouble, which leaves it exposed to credit risk. But it’s not just Italian banks that are heavily exposed to Italian debt. So, too, are French lenders, which last year had combined holdings of Italian bonds worth €44 billion, according to data from the European Banking Authority’s 2017 transparency exercise. Spanish banks had €29 billion. Which three non-Italian lenders of consequence are most exposed, in absolute terms, to Italian debt, based on Dor’s research? BNP Paribas, France’s largest bank, with €16 billion of Italian sovereign debt holdings. Dexia, the French-Belgian lender that collapsed twice and was bailed out twice between 2008 and 2011. It holds €15 billion of Italian debt. And, drum-roll please: Banco Sabadell, the mid-sized Spanish lender that already has a gargantuan self-inflicted IT crisis on its hands at its UK subsidiary TSB. It has €10.5 billion invested in Italian bonds — the equivalent of almost 40% of its entire fixed asset portfolio, worth €26.3 billion, and 110% of its tier-1 capital. 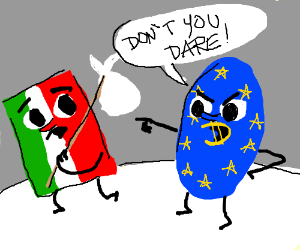 “With the data from the European Banking Authority, we estimate that the lenders that would suffer the greatest impact [of a new Italian debt crisis] are Unicredit, Sabadell and Intesa Sanpaolo,” analysts from RBC Capital Management recently warned. According to their calculations, with every 10 basis-point rise of Italy’s risk premium, Sabadell will suffer a €28 million hit to its tier-1 capital. 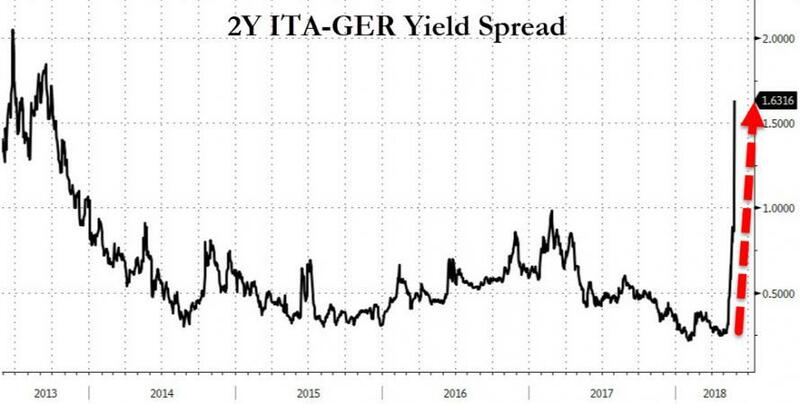 Since the coalition between Italy’s Five Star Movement and Lega was first unveiled, on May 15, Italy’s risk premium has surged by 81 basis points. To make matters worse, another third of Sabadell’s fixed asset portfolio is invested in Spanish bonds. They are also losing value, partly as a result of the contagion effect from Italy but also due to rising domestic political instability, and the approaching end of the ECB’s QE. In the last two weeks, yields on 10-year Spanish bonds have risen from 1.27% to 1.47% while the 10-year risk premium has surged from 72 to 110. When yields rise, prices fall by definition, and the more prices of Italian and Spanish bonds fall, the bigger the hit the banks’ capital buffers. The more the banks suffer, the more they will shy away from their respective domestic government’s debt, resulting in further falls in bond prices. Such is the fragile relationship of co-dependence between Eurozone banks and the governments whose debt they buy in such abundance. When banks invest heavily in government debt, they become dependent on the government’s good performance, which is clearly not a given, especially in the Eurozone. Meanwhile, the governments depend on the banks to continue purchasing their debt, which also is no longer a given. This is the “doom loop.” It’s circular. It gets kicked off when either one falters, and the consequences can be dire for both. In the case of Sabadell, it already has enough on its plate trying to clean up the mess it has created with the botched IT upgrade at its UK subsidiary, TSB, where customers are now leaving in droves. Given that TSB represents roughly a quarter of Banco Sabadell’s total assets, the impact on the Spanish bank’s own financial health could be considerable. If the sell-off in Italian sovereign debt escalates, Sabadell will have even bigger problems on its hands. Blackstone Group, Cerberus Capital Management, and others face a problem. Read… Wall Street Mega-Landlords Piled into Spain’s Rental Property Boom, and Now it Hits a Wall?